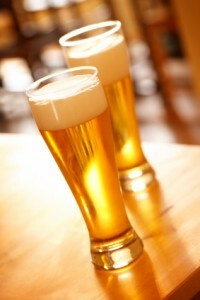 The clarity of homebrewed beer is cherished for many beer styles. Fining agents added at the end of your boil step or later in the fermenter can help to rapidly clear your beer. I previously covered a range of techniques to help clear your beer in our article on clarity. This week we zero in on one particular technique – the addition of fining agents. A fining agent is a compound added to beer to aid in precipitating and binding with compounds that reduce clarity. Fining agents generally have large molecules that are positively charged. These charged molecules attach themselves to negatively charged contaminants and then precipitate them out of the finished beer – helping these contaminants rapidly settle to the bottom of the fermenter. The three haze producing contaminants affected by finings are: suspended yeast, proteins from the malt, and polyphenols which can come from both hops and malt. A fourth cause of haze is microbiological contamination from infection, but finings will do little to help mitigate infection – so cleanliness at every stage is still important. For boiled finings, often called “copper finings”, these should be added in the last 10-15 minutes of the boil, as boiling them longer often reduces their effectiveness. Finings added in the fermenter are usually added 4-5 days before bottling or racking the beer to give the fining time to precipitate yeasts and proteins and keep these out of the finished bottle or keg. Care must be taken when adding these finings as the large molecules can create an effect called “nucleation” which releases carbon dioxide stored in the beer, and can lead to a gush of rapid foaming. Isinglass is also a collagen based additive derived from fish bladders. Used primarily by commercial brewers, isinglass is effective against all three major barriers to clarity: yeast, proteins and polyphenols. Isinglass in its pure form must be mixed with an organic acid before use, but many types of isinglass sold for homebrewer use are so called “instant” variants that come premixed with the acid needed for preparation. Be sure to follow the directions that came with your isinglass. Typical application rates are ½ tsp mixed with 1 cup of hot water per 5 gallons of beer, and allow 4-5 days before racking or bottling. I personally use Irish Moss on any beer style where clarity is important, and then use some judgement as to whether to add additional finings at bottling based on the state of the beer at that point. Naturally you don’t want to discount other methods such as rapidly chilling wort, choosing high flocculation yeast and cold storing your finished beer. Thanks again for joining us on the BeerSmith home Brewing Blog. Please subscribe or place a vote on BrewPoll if you enjoyed this week’s article. Have a great week. I regularly use Irish Moss or Whirlfloc Tablets. I’ve also used gelatin (which works very well!). But beyond that, the thought of fish bladders, and such seems a bit extreme. One recommendation though, if you choose to use fining agents in the secondary, best results are achieved if you chill the beer down to 35 degrees F before adding the finings. This way, any chill haze proteins are also dropped out of suspension, resulting in cleaner beer. For clearing beer naturally though, I suggest patience and low temperatures. Just curious about the finings in the secondary. How does one put it in the carboy? Just pour it in? And do you stir it up and how? By shaking the carboy around in circles or using some long stick? Just pour it in gently along the side of the carboy. You can stir it with a sterilized stick/wand. I usually use my siphon wand. I’m going to use gelatin for the first time on an American Blonde Ale – thanks for the info! Can I just use a dissolved Whirlfloc table? I don’t have anything else right now. I will go get some gelatin later and try that. I assume you a trying NOT to stir up the bottom settlement? You can use whirlfloc at the end of the boil, but it will not work as a fining agent after fermentation. I would recommend a quick trip to the grocery store where you can find unflavored gelatin which will work much better. I appreciate you sitting by the computer waiting for my questions!! How long the in the secondary? One day, two, a week? If you add gelatin to the secondary and want to bottle the beer, should you add yeast at bottling time to make sure the beer carbonates? I’ll write a synopsis of this for the forum. Perhaps there can be a little discussion this. My experience (8 batches now!) is that I need to get the bottles to a warmer area for the bottled yeast to get going (at least for a few days or week). I’ve had low carbonation because I had the bottles downstairs where it is 60* or so. Correct my procedure if this is not the right way to do this. Carbonation will go slower if you are doing it in a cool area – in general you should keep your beer within the recommended temperature range of the yeast for 1-2 weeks while it carbonates. I am having a carbonation issue with another batch and will address that in a forum post. Someone (Useless Brewing) said that gelatin strips out too much yeast and that he doesn’t do that. He said there is a little yeast left and that it would take a long time. You have suggested that there is enough. Not sure what to do now. I tend to believe you and will probably do that. Should I have the bottles at a temp at 70* or so, or is that too high? Here is just one more data point among many: I just started drinking a batch of Light Lager that I used gelatin to help clarify. The carbonation went just fine (without adding extra yeast) but it was slower than expected (2 weeks: still a bit flat; 3 weeks: perfect). A quick question re: gelatin; safe to assume the recommended amount of one teaspoon is for a five-gallon batch? Thanks for all the excellent advice!! Is there any chance the gelatin will “strip” hop flavors? I have an APA that I forgot to add Irish moss to and want to retain hop notes (can’t believe I said “notes”) but want clarity as well. I have transferred to secondary and started dry-hopping and it looks pretty murky. Thanks and beersmith 2 is amazing! Why would I not add the gelatin finings to the primary about 4 or 5 days prior to racking to a secondary? I’d personally rather leave any and all unnecessary “junk” in the primary. Any opinions on that? This may sound overcautious, but I don’t like the sound of pouring any water in my beer. Could I pul a small amount of the said beer, heat (without adverse effects) to temp, add the gelatin, cool, and add the combined two back to the batch? It’s about 12 gallons of all grain Dunkel setting in the secondary at 35F. Can I combine Isinglass and Silica gel to stabilize my beer? It is not a bad idea to first boil the water, then chill it to about 170 – 180 degrees. That way you reduce the dissolved oxygen level of the water from about 8 ppm to 0.1 ppm. Skipping this would only add about 0.1 ppm of dissolved oxygen to your beer, but that is more than what production breweries hope to have in their final beer. Breweries generally shoot for 50 ppb, or 0.05 ppm in finished beer to improve shelf life. I am confused. You say PolyClar is added to the fermenter but the info from the mfgr (Ashland) says add at the end of the boil? I added PolyClar 10 at the end of the boil? Poured into my primary and pitched my yeast. It’s been 13 hours and no bubbling yet. Did I screw my beer up by doing the polyclar at end of boil? I wonder If I use gelatin along with Whirlfloc tablets, there will be some priming issues. Do you think it’s oj to use both? Yes you can use both – there should be no major issues at all as they are different phases of brewing. What is the best option for an 1,000 litre system other than isinglass? Cheers. Annoyingly I used Beer Brite Isinglass finings, and absent-mindedly poured it into the barrel without mixing with cold water first. Will the beer be ok, or have a ruined it? Gluten Free Beers: A Review & How to Brew a Good One!